Greek Mythology and Zeus in particular has been a source of great inspiration for slots studios over the years, and here is WMS Gaming’s latest contribution to that illustrious catalogue of titles. 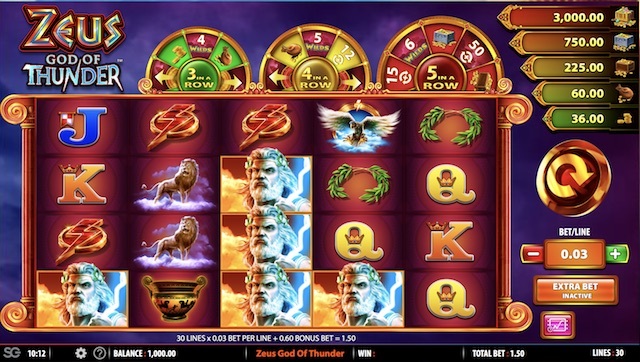 Zeus God of Thunder Slot truly is a phenomenal game, and striking in its appearance from the moment the game window opens. It is a 5 reel, 4 row and 30 payline slot, with the addition of 3 spinning wheels that sit at the top of the game window. 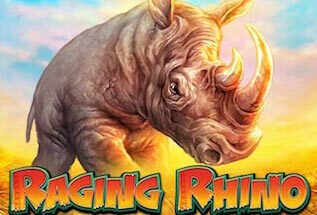 They can be randomly triggered to deliver up to 100 Free Spins, 7 extra wilds for one spin, and a chance at five jackpot wins. The game operates at a medium to high variance and the Zeus God of Thunder RTP is 96.05%. You can play on any device – mobile, tablet of desktop – and for free or for real. The stakes per spin start at 50p and with a variance on the high side, you may wish to run a few spins through before spending hard cash, just to get a feel for the rhythm of the reels. Play now at one of our recommended casinos with a 200 Free Spins and £1,200 welcome package – Casumo Casino. Or read on for our full review of this game and all its features. When it comes to Greek Gods, Zeus was of course top dog! The main man indeed. So it’s no surprise that his latest slot is an epic event. The backdrop to the reels is purples skies, rolling clouds, lightning and thunder. The reels themselves are colored rich reds and golds, with stone pillars to either side. The lower value symbols are the cards Jack through Ace, and the higher value ones are a Greek Urn, a Reef, a lightening boldt a lion, an eagle, and Zeus himself. There is also a Wild symbol that only lands on reels 2, 3 and 4, and can substitute for any other symbol in a payline and will automatically trigger a 2x multiplier when it does. Watch out as well for the background that appears on any symbol – it is like a scatter and when three or more appear on adjacent reels in a line, will trigger a spin of the bonus wheels. 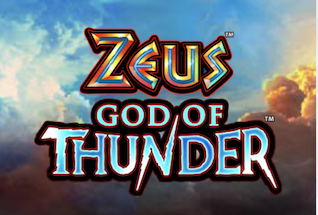 Zeus, God of Thunder, can be played from 50p up to £75 per spins. Use the Bet per Line configuration to determine how much each spin costs. There is also an Extra Bet option that costs more and opens up additional chances to win in the bonus rounds where the wheels spin. The most important feature here is the Wheel Spin bonus round, triggered when 3 or more backgrounds appear behind symbols on the reels. They must appear in a line directly adjacent to one another. 3 in a row will give you access to the smallest wheel, 4 to the middle reel, and 5 to the top reel. On each wheel you can win an upgrade to the next wheel, a free spins bonus round, a spin of the Wild Spin Zeus Bonus, or a Jackpot. There are five jackpots in total, the Mini and Minor are accessible from Wheel 1, the Minor and Major from Wheel 2, and the Major, Mega and Grand are available from Wheel 3. The Major is worth 100,000 coins. The Wild Spin Zeus Bonus is a free spins of the reels with extra Wilds added to increase your chances of winning. On the top wheel you can win an extra 7 wilds with your free spin. Finally, the Free Spins bonus round will land you up to 100 Free Spins if you are playing on the top wheel and have the Extra Bet button set to active. WMS have done the Zeus slots series justice with this latest release. Zeus God of Thunder Slot is a hugely enjoyable game. You can choose to play with or without the Extra Bet button active. Either way, there are chances of some terrific payouts at all levels, and if you can hit the top wheel and land the Free Spins then you have a great chance to accumulate a nice cash pot.